As a periodontist, we often see patients that need a deep cleaning in their mouth - one that is a bit more intense than the general cleaning provided by the general dentist. This occurs when there is plaque and bacteria beneath the gum line that cannot be reached with normal cleaning procedures. This is necessary for some people that may experience some issues with their teeth or gums that can be caused by a variety of different things. Issues can derive from genetics, poor overall health, or lack of regular visits to a dentist for treatment and prevention. Along with recognizing problems associated with gum disease is also being aware of other health problems that can be directly linked to oral decay. Some of these longterm health issues are: increased risk for heart attack or stroke, kidney disease, stress/anxiety, diabetes, and possible pregnancy complications. If required, a visit to our periodontist office may be something you haven't necessarily planned for, but it doesn't have to be a stressful or intimidating experience. Don't be afraid of terms like "scaling" and "root planning". These are procedures that we may need to perform to get you back to good oral health, but we perform on a daily basis. Scaling and root planing are just two of many procedures we offer. 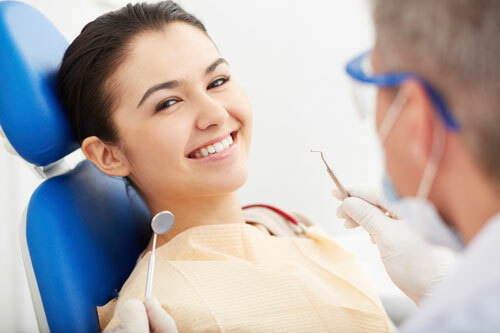 Depending on the condition of the teeth, these two procedures can be very successful and help planing are ways to irrigate the gum line and help remedy or prevent gingivitis and gum disease. Normally, a pocket (or V-line) on an individual's gum between the teeth is approximately 3mm or less. When periodontal disease occurs, these pockets can get much deeper. The deeper the pocket, the more food, plaque/tartar, and bacteria can build up, causing severe pain, bleeding, and sensitivity to the teeth and gums. • Scaling: Scaling is a procedure that involves the removal of plaque/tartar from the surface of the tooth. An anti-microbial solution is commonly used to flush out and reduce any lingering bacteria under the gum line. • Root Planing: Root planing is a procedure that concentrates on removing cementum and surface dentin at the root of the tooth. This area may be harboring excess bacteria and tartar. Each patient is different, and depending on your assessment, local anesthetic may be used. Following scaling and root planing, a patient may experience swollen and bleeding gums for a few days, but this should gradually stop over time. Follow up after this procedure is imperative for overall health. This allows us to check on the healing process from your procedure, discuss with you any concerns you may have, and also address any complications that may have arisen. If a patient still has pockets that are deeper than 3mm, an additional procedure may be needed. Don't panic! This is part of your oral health and it's important you follow through with your treatment and preventative measures. Flossing and brushing regularly, coupled with the right brush and techniques, can put you on the right path to future excellent dental health. This is your preventive action to ensure your overall health is in the best condition as possible. Scaling and root planing is one of the most important things you can do for your oral health. If you are in need of this procedure, please call us at 480-376-2848 opt. 1 today!